Background: Delivery of conventional small molecule drugs and currently evolving nucleic acid-based therapeutics, such as small interfering RNAs (siRNAs) and genes, and contrast agents for high resolution imaging, to the target site of action is highly demanding to increase the therapeutic and imaging efficacy while minimizing the off-target effects of the delivered molecules, as well as develop novel therapeutic and imaging approaches. Methods: We have undertaken a structured search for peer-reviewed research and review articles predominantly indexed in PubMed focusing on the organic-inorganic hybrid nanoparticles with evidence of their potent roles in intracellular delivery of therapeutic and imaging agents in different animal models. 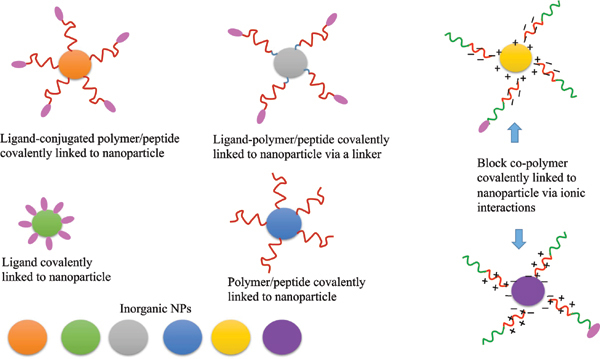 Results: Organic-inorganic hybrid nanoparticles offer a number of advantages by combining the unique properties of the organic and inorganic counterparts, thus improving the pharmacokinetic behavior and targetability of drugs and contrast agents, and conferring the exclusive optical and magnetic properties for both therapeutic and imaging purposes. Different polymers, lipids, dendrimers, peptides, cell membranes, and small organic molecules are attached via covalent or non-covalent interactions with diverse inorganic nanoparticles of gold, mesoporous silica, magnetic iron oxide, carbon nanotubes and quantum dots for efficient drug delivery and imaging purposes. Conclusion: We have thus highlighted here the progress made so far in utilizing different organicinorganic hybrid nanoparticles for in vivo delivery of anti-cancer drugs, siRNA, genes and imaging agents. Keywords: Animal model, biocompatibility, cancer, carbon nanotubes and quantum dots, cell membranes, cytotoxicity, delivery, dendrimers, drugs, gold, lipids, magnetic iron oxide, mesoporous silica, nanoparticles, organic-inorganic hybrid, peptides, pharmacokinetics, plasmid, siRNA. Keywords:Animal model, biocompatibility, cancer, carbon nanotubes and quantum dots, cell membranes, cytotoxicity, delivery, dendrimers, drugs, gold, lipids, magnetic iron oxide, mesoporous silica, nanoparticles, organic-inorganic hybrid, peptides, pharmacokinetics, plasmid, siRNA. Abstract:Background: Delivery of conventional small molecule drugs and currently evolving nucleic acid-based therapeutics, such as small interfering RNAs (siRNAs) and genes, and contrast agents for high resolution imaging, to the target site of action is highly demanding to increase the therapeutic and imaging efficacy while minimizing the off-target effects of the delivered molecules, as well as develop novel therapeutic and imaging approaches.